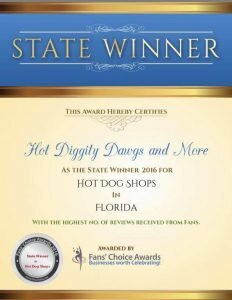 2016 Winner of Best Hot Dogs In FL & U.S.A.
We are North Florida’s Premiere Hot Dog Cart, Hot Diggity Dawgs and More. We are a locally established, licensed, insured Hot Dog Cart and Catering Vendor serving up North Florida’s BEST tasting Dawgs! Established in April of 2008, Hot Diggity Dawgs and More has been featured four times on WTLV, most recently Memorial Day 2010 and has served to crowds in excess of 3000 from WJCT, the fans of Florida Georgia weekend as well as the crowds at Dancin in the Streets, Neptune Beach since 2011. There is no event that is too large or small. We Cater Any Event and will diversify our menu to fit your needs. 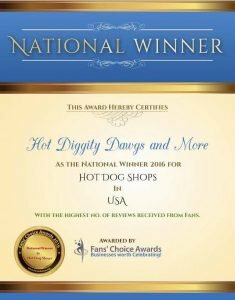 Whatever the occasion, Hot Diggity Dawgs and More will diversify our menu to fit your needs. We use nothing but 100% All Beef Nathan’s Hot Dogs and the finest Sausage made locally by Azar and newly added Fontanini Sweet Italian Sausage which has become our number 1 selling Italian Sausage of all time. But we’re not going to stop there because we are also serving Philly’s Steak Subs with options such as Mushrooms, Peppers, Onions and Cheese served up on a fresh Amoroso sub rolls. We are a full service Hot Dawg Stand and set the industry’s standard for quality and professionalism. 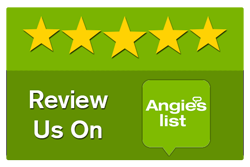 Our stand is fully licensed, insured and was awarded the “Shinny Spoon” award by the Florida Times Union for having spotless inspections consecutively since June of 2010. Our food is served fresh daily and is surrounded by the softest bread. We pride ourselves by taking no short cuts and serving our Nathan Coney Franks Island Jumbo on a fresh warm bakery fresh hot dog bun and we even have a vegetarian option for those that are looking for something different. When catering your event (with advance notice) we can diversify our menu at a moment’s notice. For more info and pricing, call us at 904-477-3414 and let us help you plan your next event or email us. Below is our signature menu. We proudly serve Nathan’s Jumbo All Beef Hot Dogs with a variety of toppings, Philly’s Finest Steak Subs with your choice of peppers, onions, mushrooms, and the world famous Fontanini Sweet and Spicy Italian Sausage as well as everyone’s local favorite Azar Mild Smoked and Spicy Sausage. Call us to schedule your special event/function, there is no event that is too small or too big. Let the professionals plan your next event. We have serviced Car Dealerships, Auto Clubs, Employee Appreciation Day, Grand Openings, Office Parties, Birthdays and Yacht Clubs. We offer catering services throughout Duval County, Clay County, St Johns County, and Nassau County. 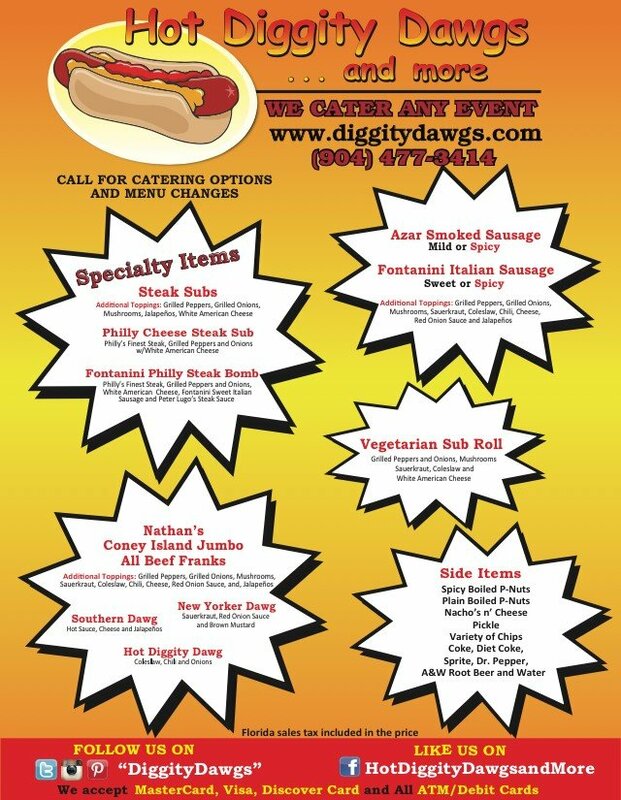 For more info call (904) 477-3414 to have Hot Diggity Dawgs and More cater your next event. You can also FAX us at: 904-903-7937 or fill out our online form below.